After much anticipation and more than half of the world has already seen it, the time has come for the summer blockbuster season to kick off in the United States with THE AVENGERS. Finally, after four years of waiting and setting up the background stories in each film for Thor, Captain America, Iron Man and Hulk, at last they have finally assembled, along with Hawkeye and Black Widow. While it might have been in everyone’s wildest dreams that a blockbuster of this calliber like The Avengers would actually manage to be good, think again, this movie is GREAT. Joss Whedon and the crew behind this film make sure that if you loved one of these superheroes before, you end up loving them more. This movie manages to set the bar for future blockbusters because not only is it paced right, it has the right amount of comedy and action as well as an actual story behind it that makes it stand out from other superhero films. From the moment I watched the trailer, I thought this movie would be: either really good or really bad. I thought that by having an ensemble cast such as this one that the script would be weak, the effects too overdone or that the movie would drag in between. The Avengers is the biggest cinematic event in recent history, bigger than any other superhero film, throwing protagonists that each come from their own blockbuster franchise into one single film and having them work with each other. Thankfully, Joss Whedon pulled it off, and with the help of Iron Man, Iron Man 2, Captain America: The First Avenger and Thor, we get the character introduction we needed before watching them assemble. However, there is still some moments within the first minutes of the film where you see a brief summary of where the characters are before Nick Fury (Samuel L Jackson) and S.H.I.E.L.D ask for their help to save the planet. This is what you need to know about the movie: There’s an immense energy source in a cube called the Tesseract, which is under the control of Nick Fury’s S.H.I.E.L.D. The Tesseract recently has been activated and it opens a portal through space. Thor’s half-brother, Loki (Tom Hiddleston), after being exiled from Asgard makes a deal with the Chitauri, an alien race whose main goal is to rule the universe, in which he would go through the portal to Earth, the Chitauri would send an army and once they took over the planet, make Loki our ruler. Once he steps on Earth, Loki, with the help of his mind control abilities takes two people from Nick Fury’s personnel: agent Clint Barton (Jeremy Renner) otherwise known as “Hawkeye”, and Dr Erik Selvig (Stellan Skarsgard) who knows how to open the portal. In response to the attack, Fury brings back the Avengers Initiative, in which superheroes help defend humanity in the battles we cannot fight ourselves. The only people that can stop Loki and his army are Steve Rogers/”Captain America” (Chris Evans), Tony Stark/”Iron Man” (Robert Downey Jr.), Thor (Chris Hemsworth), Dr. Bruce Banner/”The Hulk” (Mark Ruffalo) and Natasha Romanoff/”Black Widow” (Scarlett Johansson). Each character gets their own time to shine, and is brought to life again this time around from where their previous films left off. We see Captain America waking up sixty years later, and realize that this isn’t anymore about World War II, there are bigger threats out there. He is vulnerable with what his place in this new world is, but is as always the same kind-hearted, leader type of guy. Thor is the only one who truly knows Loki and would be able to talk him down and make him realize what he is doing. Hulk, portrayed at it’s best by Mark Ruffalo, shows him isolated from society and rather keeping himself calm through work as a doctor, never even mentioning “the other guy”. Iron Man, is still the same cocky guy from Stark Industries with amazing one-liners, that even at one point in time was rejected by S.H.I.E.L.D to be part of the Avengers Initiative. The fun part of the film is when these characters are finally together and bickering at each other, it was a complete delight to see their personalities clash, while still trying to overcome their differences to find a solution to recuperate the Tesseract. The film isn’t completely perfect, minor details like previous set-up before some scenes might have some people wondering what is going on exactly. However, like I said they are minor and by the time the movie is over you’ll get to really appreciate the movie as a whole, and realize how much fun it was to see. 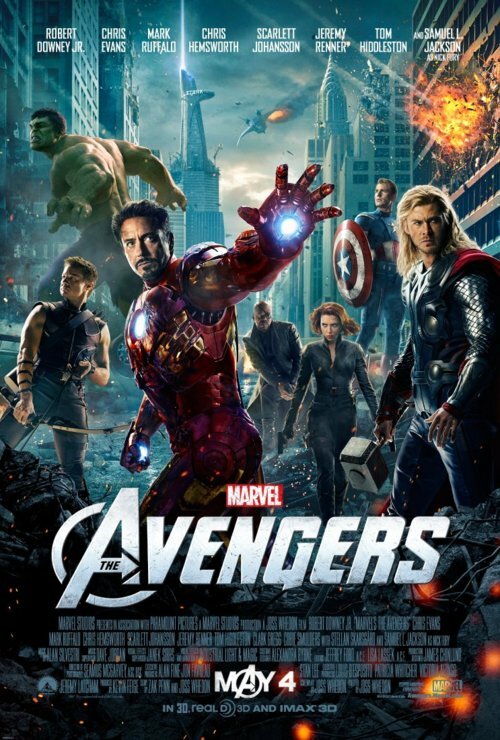 The Avengers balanced action, comedy and drama, without dragging the story too much and making every fanboy and fangirl out there dreams come true by watching all of these characters work with each other, and actually do it well.Visually intriguing, with a script that is actually good, The Avengers is an exhilirating fun ride and the best way to get ready for more superhero blockbusters coming our way. PLEASE MAKE SURE YOU STAY AFTER THE CREDITS! 2 extra scenes! The Avengers hits theaters in the US on Friday, May 4th.